From FPV racing to aerial video shooting, FPV is the lifeline between your aircraft and the pilot/camera operator. It is what a cameraman uses to frame up those epic shots from a multirotor and it is the pilot’s “eyes” in an FPV racing machine. 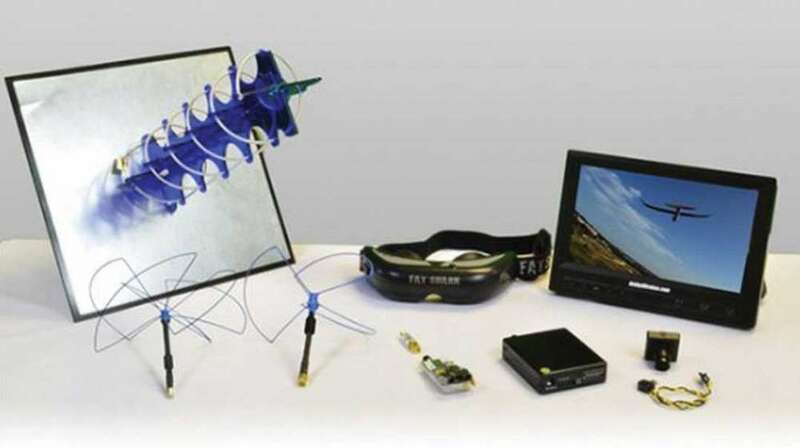 The standard frequencies for FPV in the USA are 5.8GHz, which you will see as a standard on most aircraft, and 2.4GHz, which you will find on most aircraft that generate a Wi-Fi network to transmit the video signal back to the pilot. Accessory kit includes antenna and RCA A/V cable. Systems using 2.4GHz offer a great balance of performance and antenna size. 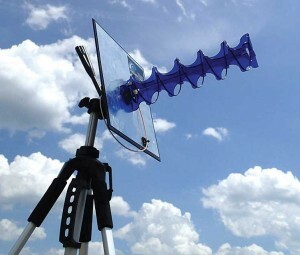 The antennas are very manageable and their signals can travel for long distances (over a mile). The problem with this band is that it is the standard frequency that we use on our transmitters and using a video system on the same frequency can run you the risk of interference and possible loss of control of your aircraft. Typically, you will see 2.4 being used on machines like a DJI Phantom Vision 2 as they generate a Wi-Fi network back to the transmitter. On these machines they will actually use the 5.8GHz band for the aircraft control. The common frequency for Wi-Fi networks is 2.4GHz, which also leaves this band vulnerable to interference from home and business Wi-Fi networks as well as cell towers. Mind you, on these systems, such as the Phantom 2, they are not transmitting video in the same way that a true 2.4GHz video system would; they create a Wi-Fi network instead. and penetration. So flying at longer distances or in areas with obstructions, like trees and buildings will diminish your video reception and can possibly lead to complete loss of video, which is very bad for a FPV race machine that you are flying using video goggles. The upside of 5.8GHz, however, is that there are many channels that you can utilize and there are really no known problems with other equipment. So what do we do when we need longer range or when we are in an area where there are a lot of obstructions to give us a strong video link? We look at lower frequency FPV solutions like the Aun1012-Plus Duo 500/1000mw 1.2/1.3 Long Range Full Combo from Hobby Wireless. Before I dive into the benefits of the 1.3GHz, it is important to know that the FAA guidelines state that you should always fly within visual range of the aircraft, which sort of puts a limitation on one of the benefits of a 1.3GHz FPV system. I can tell you from personal experience that there are some very real benefits of a 1.3GHz system even when flying within line of sight. The 1.3GHz band offers excellent range and penetration with a consistently low noise floor. In general, the band offers consistent performance as well as long range and penetration. It is the most common frequency used for long-range piloting and because of this, the band is getting crowded by video pilots and it is also known to have issues with certain long-range radio systems. We tend to fly aerial production jobs in urban environments that can often wreak havoc with a 5.8GHz video band and when you are the camera operator with a director looking over your shoulder chomping at the bit for the golden shot, it is important to have a solid video for him to look at and you to make corrections and adjustments according to his direction. We have had several cases where 5.8GHz would not produce a reliable video link, even at distances well within line of sight. Because of this, we have incorporated the Aun1012-Plus Duo 1.3GHz system onto our large X8 machine to ensure that we have a positive long-range link for video. I also find the 1.3GHz band very desirable for FPV quad racing because the penetration is much better when flying around obstacles such as trees and buildings. The problem with 1.3 on a mini quad is the antenna size, transmitter weight and power consumption. A typical 5.8GHz omni antenna has a diameter of around 1.25 inches, which is perfect for a 250-size mini race quad. The typical size for a 1.3GHz omni antenna is around five or six inches. Additionally the transmitter is heavier and consumes more power, which in turn, lowers your flight time. So while this is very desirable for race quads, it can, depending on the machine, be very impractical. This 1.3GHz system from Hobby Wireless has also found a home on a 1-meter FPV aircraft that I am building. I have tested the system on a sailplane of the same size and I was completely impressed with the link quality and extreme long range that I was getting. In this plane, according to my OSD, I was out well over 6,000 feet from where I took off and the video signal was as solid as if the plane were in front of me. Now I am not advocating flying long range (beyond your line of sight) and if you do have a desire to try this, you need to find a location that is free of houses and people such as a large forest or some of the huge fields you see in the Midwest. One application for this type of system on an airplane would be for crop inspections and agricultural use on large farms with hundreds or thousands of acres of land. In cases like these, you are still maintaining a visual on the aircraft, but it will be very small to the naked eye. However, looking at your FPV screen, you will have a solid, dependable video signal to allow you to fly safely. WHY THIS SYSTEM IS SO GREAT! 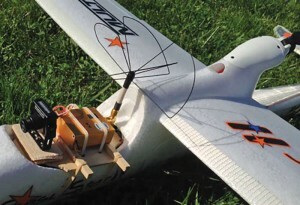 Hobby Wireless took all of the guesswork out of buying components for a long-range 1.3GHz FPV system. They packaged not only a very reliable transmitter and receiver with over 1000mW of capable power, but they also matched the system with Omni and Helical antennas from IBCrazy. For those of you who don’t know Alex Greve (aka IBCrazy); Google him and check out some of his YouTube videos. I don’t know if there is anyone in the industry that is more knowledgeable on antenna design than him. The Bluebeam Ultra Omni 1.3GHz antenna set gives you a strong signal and reception over a wide angle from the pilot. You can fly pretty much all around the antenna and have a solid video link. The Helical antenna, which is mounted on a tripod, is a highly focused, long-range antenna with a narrow angle of reception. 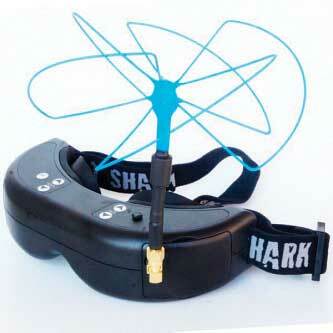 If you are flying out in front of you for long distances, then the helical antenna can give you a very long (2+ mile) FPV signal without having to refocus the antenna. 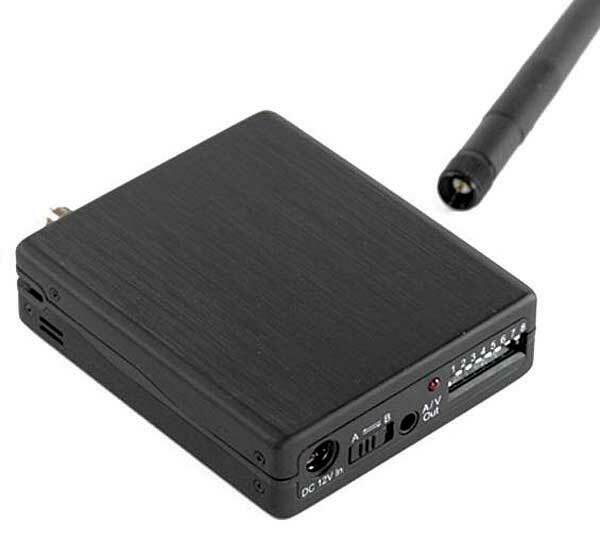 The best solution is to have both antennas connected to a diversity system with two receivers and the system will take the strongest signal and display that video with no interruption to you. This way, when you are close the Omni antennas will work best and as you fly farther out in front of you the helical antenna will deliver the best signal. They include a very nice seven-inch FPV monitor in this package as well, which is perfect for most of the FPV flying that I do. Of course you can always take the video output from the receiver and feed that into your favorite FPV video goggles or a larger monitor.